“Political Correctness Is BS: How Far Left Activists, Judicial Misconduct, and Political Corruption Are Ruining America” from Christian Faith Publishing author Charles S. Togias is a hard-hitting, in-your-face attempt to wake people up to the shakiness of the way the US government is being run, with lawyer-distortion tactics and a manipulative stance founded on a warped view of the Constitution. The author energetically weaves together this broad discussion to illustrate Abe Lincoln’s conclusion that the people are ultimately the masters of the Congress and the courts. “Political Correctness Is BS”: an intense state-of-political-reality commentary. “Political Correctness Is BS” is the creation of published author Charles S. Togias, a Vietnam vet, former salesman and sales manager, a multi-title political and business author, and senior record-breaker for physical feats such as 630 chin-ups in 2.2 hours at age seventy. Togias shares, “I have written my book to emphasize how the left is trying to change America from a loving Christian democracy to a socialist country with the elimination of our Christian beliefs and the redistribution of wealth. I want to end this chapter with how the mainstream media is helping in this effort. I said that if you have a hammer and pound hard enough and long enough, you can fit the round peg in the square hole, and that is exactly what some in the media do by either spinning the truth or not reporting stories that attack those they agree with to give credence to this socialistic agenda. Published by Christian Faith Publishing, Charles S. Togias’ new book offers an unflinching view of America’s current political landscape that, true to its title, doesn’t pretend to political correctness, preferring instead to say it like it is. Originally written in frustration with America’s political situation further complicated by mainstream media, the book shares the broad ethos of a very practical, conservative point of view. View a synopsis of “Political Correctness Is BS” on YouTube. 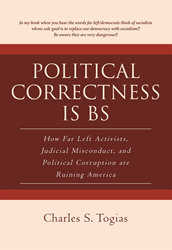 Consumers can purchase “Political Correctness Is BS” at traditional brick & mortar bookstores, or online at Amazon.com, Apple iTunes store, or Barnes and Noble. For additional information or inquiries about “Political Correctness Is BS”, contact the Christian Faith Publishing media department at 866-554-0919.